1664: Rokuemon plays in the first play divided into several acts of Kabuki history, which is staged in Ôsaka. The author of the drama is his master Fukui Yagozaemon and the title is "Hinin no Adauchi". It narrates the tribulations of a young man who has to disguise himself as a beggar in order to look for the murderer of his father. Rokuemon's others stage partners are Araki Yojibê I and Nakagawa Kinnojô. 6th lunar month of 1674: Rokuemon performs as a tachiyaku in Kyôto at Ebisuya's theater; his stage partners are Fujita Koheiji, Komai Shôzaemon, Imamura Kumenosuke, Fujita Minanojô, Nanboku Sabu I, Nakajima Yaheita, Itô Kodayû II, Tamagawa San'ya, Dekijima Tanomo and Kumamoto Bun'emon. 1682: Rokuemon becomes zamoto in Ôsaka. Kaneko Rokuemon was active in Kamigata from the beginning of the 1660s to the beginning of the 1680s. 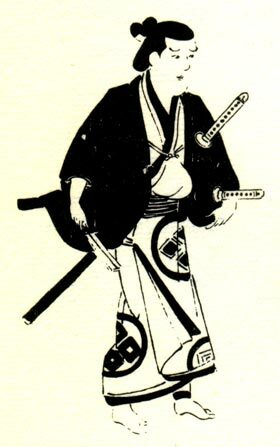 He was a tachiyaku, excelling in teoigoto. He also worked in Ôsaka as a zamoto.